Many organisms consist of a huge number of cells. But, how are they organised to form e.g. a fully functioning animal. Cells are the building blocks of multicellular organisms. In the process called differentiation, cells become specialised to carry out a particular function. Differentiation happens during the growth and development of a multicellular organism. Specialised cells form tissues, which can connect to form organs and these connect together to form organ systems. Large multicellular organisms like animals have different organ systems for exchanging and transporting substances. A tissue is a group of similar specialised cells that work together to carry out a particular function. Obviously the cells must be connected in someway AND there may be different types of cell cooperating with each other. Layers of epithelial cells make up epithelial tissue which covers a lot of the body, including the inside of the gut, including the stomach. Muscular tissue must have the ability to contract (and relax) to move whatever the tissue is attached to e.g. bones. Glandular tissues are production sites for enzymes and hormones - important secretions for the efficient functioning of organs. An organ is a group of different specialised tissues that work together to perform specific functions. The stomach is an organ that uses all of the three tissues mentioned above. The inside and outside lining of the stomach is made from epithelial tissue - it holds the stomach together and contains food starting to be digested. The wall of the stomach has attached muscle tissue to enable it to churn up food prior to digestion. Glandular tissue makes digestive juices to breakdown the food at the start of the digestion process. The digestive system of mammals is an excellent example of an organ system - this organ system breaks down food and absorbs the molecules and ions. It consists of a whole series of organs and glands working together. 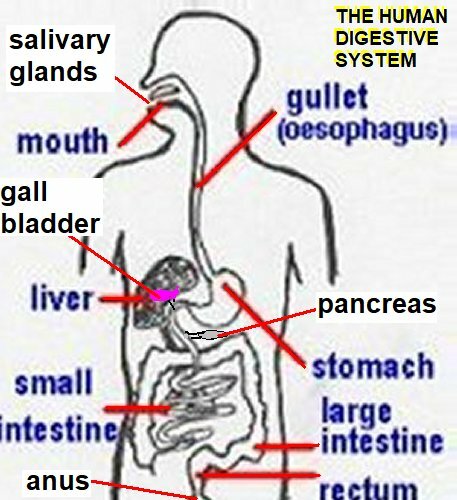 (1) The pancreas and salivary glands produce digestive juices containing enzymes to break down food. (2) The stomach and small intestine digest the food - nutrients pass from the small intestine to the blood stream - absorption of soluble food molecules. (3) The liver produces bile that helps digestion in the small intestine. (4) The large intestine absorbs water from undigested food to leave the waste as faeces. The human body contains 11 important organ systems, including the circulatory, respiratory, digestive (described above), excretory, nervous and endocrine systems. They also include the immune, skeletal, muscle and reproductive systems. All these systems work closely together to maintain a fully functioning healthy human body. The failure of any of the organ systems can lead to a serious, and potential fatal, medical condition.